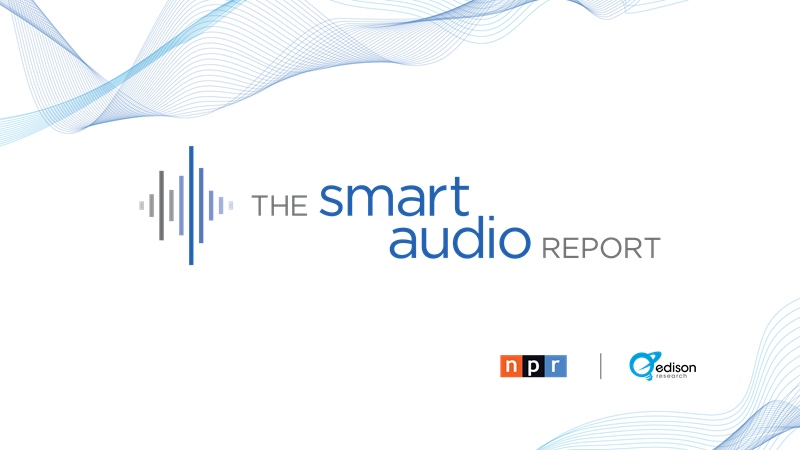 Today NPR and Edison Research released the latest edition of The Smart Audio Report, an ongoing consumer survey of how American adults are acquiring and using smart speakers. The information was released in an online webinar presented by Edison Senior Vice President Tom Webster. The report was framed with two points from another ongoing research project — The Infinite Dial, an annual study of American listening trends from Edison Research and Triton Digital. First, 18% of Americans 18 years or older own a smart speaker. That’s about 43-million people. 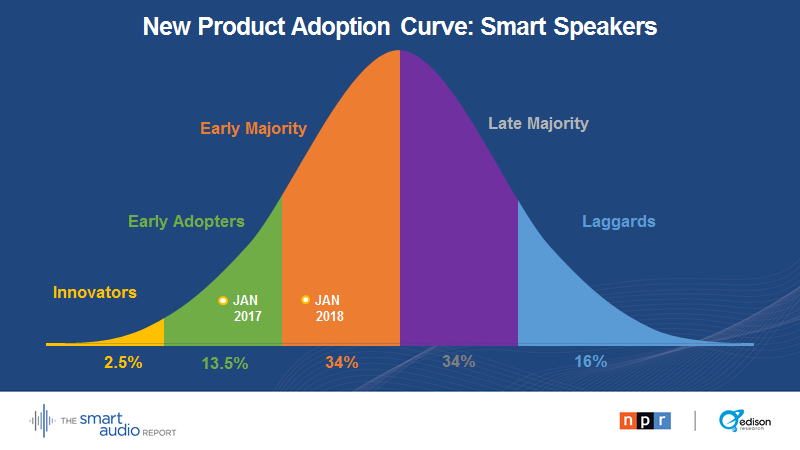 Early Adopters use their smart speakers in advanced ways like controlling parts of a smart home. 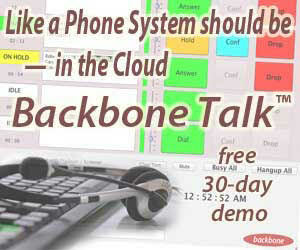 Early Mainstream users go for a wider range of daily activities like making calls and getting traffic reports. 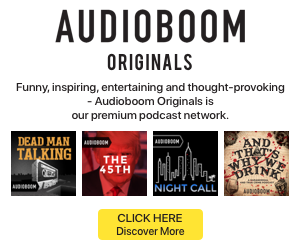 What about podcast listening? The survey sought to benchmark how much Americans listen to podcasts, in the framework of comparing the Early Adopters with Early Mainstream folks. The Early Mainstream users consume podcasts at least once a week to a greater extent than Early Adopters. About a third of the whole group never calls up a podcast. One striking result of the report comes from asking what is getting replaced by smart speaker time. The top-rated answer is AM/FM radio. 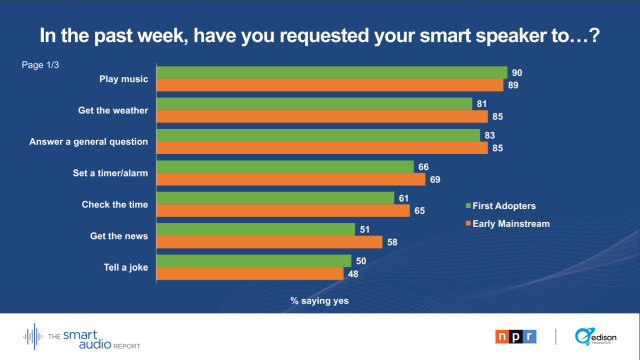 Interestingly, the Smart Audio Report queried its respondents about their attitudes toward ad types. The most liked form of sponsorship, by far, is brand-created skills. (Consider RAIN’s report of the new MarketPlace skill, with all original content.) Following that #1 result, perhaps unsurprisingly, is the classic host-read advertising message in podcasts. That marketing style is fairly free-form, especially in the hands of creative hosts, while also leveraging the reputed intimacy and trust established between host and listener. 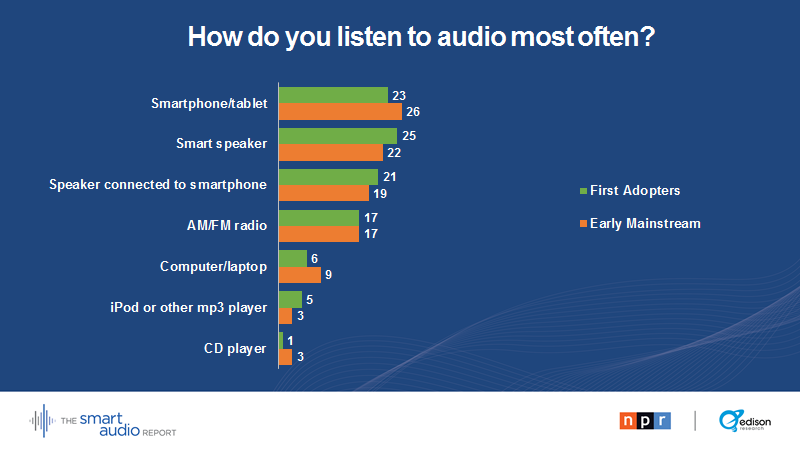 In audio, radio commercial breaks are the least favorite ad type, “hated” by nearly half the survey population. As always Tom did an amazing job presenting the material. You’re unfortunately missing a few slides that highlight radio engagement. 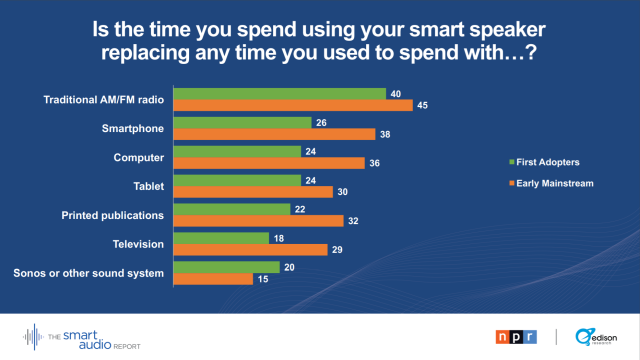 Yes smart speaker users rank radio as the number one replacement however that’s a physical representation. Tom also pointed out in a later page that the number one request made in the past week for both groups was requesting their smart speaker to ‘listen to AM/FM radio’. 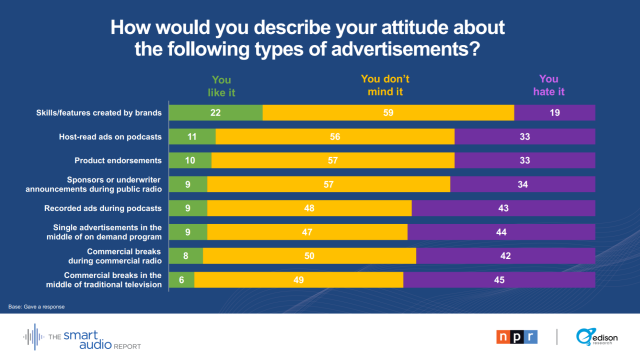 We also see the advertising acceptance levels to be very positive at 58% either liking or not minding advertising breaks on radio. Success is a variable judged in the eye of the beholder. As a radio representative in the business for 26 years I see smart speakers as a tremendous conduit to great spoken content in the form of traditional radio and podcasts. Thank you for the thoughtful comment, Harry, and I agree on all points.